Welcome to the website of ‘Bed&Boat’. 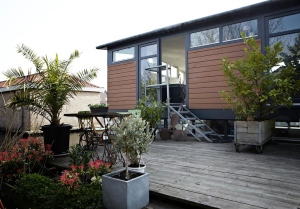 Always dreamt to stay on a houseboat in Amsterdam? This very charming two room apartment is a complete separate part of a modern large ‘water villa’ and is situated at the ecological structure around Amsterdam, yet only 30 minutes away from the historical city center of Amsterdam. During your stay in ‘Bed&Boat’ you will be floating on one of the water ways around Amsterdam. After a packed day of exploring Amsterdam, you can escape the hustle and bustle and have peace and tranquillity at the apartment, chilling with the birds and water. So if you want to relax just open the patio doors to the water front and see the ducks and boats pass by or take a seat on the nice private sun deck on the shore front and overlook the luscious garden and scenery. Take a walk or the available city bikes and visit the windmill, the teahouse or the historical village of Sloten. Either way, just let it flow….